BALCAS workers took to the picket lines on yesterday morning for a 48-hour strike aimed at securing a pay increase. The strikers, who claim their current pay deal leaves many workers barely making minimum wage, received great support from the public and other workers from the outset on Tuesday, with motorists blaring their horns as they passed the protest at the Trory woodchip factory. 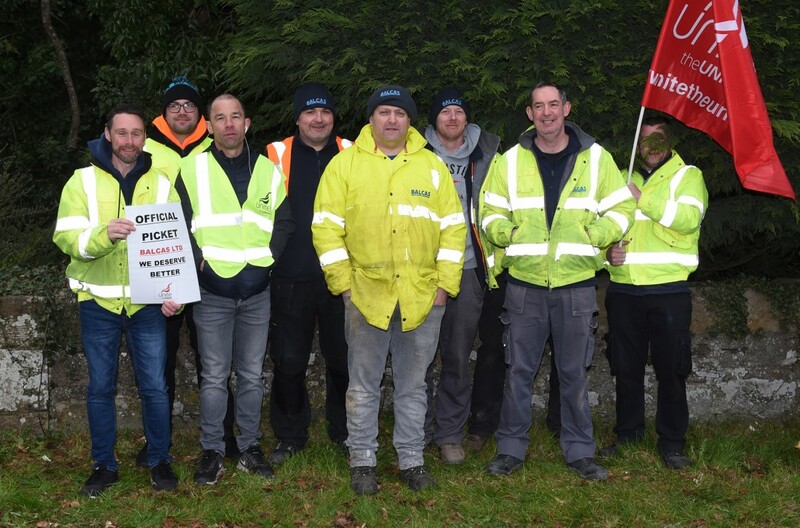 Even some hauliers who arrived at the Balcas plant unaware of the protest, which began after workers on Monday voted in favour of industrial action, refused to cross the picket line in a show of support. Unite shop Steward Rory O’Donnell said no one had wanted the strike to happen in the first place, but the workers felt they had little choice. “No one wants to stand out here. It’s come to this point where we’ve had to come out. Hopefully something will happen now,” he said, adding if no resolution was found they would be taking to the picket line for a week next. Speaking on Tuesday, Unite’s Donal O’Cofaigh said Balcas was making millions, and had benefited from the RHI scheme. “Balcas are disappointed an agreement has not yet been reached through constructive discussion, said a spokesman. “Our current offer equates to more than twice the rate of inflation for the average employee. “Balcas thinks this is a fair and reasonable offer.